On a Windows PC recently I ripped a CD only to find out that it was converted as WMA rather than MP3. In Windows this isn’t a big deal, you just open the files in iTunes as usual, but I wanted them on my Mac, easy right? Well for some reason Apple doesn’t allow Mac iTunes to convert WMA files to MP3 audio so I was a bit frustrated, to make matters worse a typical google search will net you a ton of ancient apps that like to crash a lot, or ones that try to charge you some-odd dollars to convert an audio file… forget that! Using a program like this is helpful when iTunes won’t play a song, it’s usually because the format is incompatible with iTunes or because the file is corrupted. UPDATE: Some users report issues with All2MP3 either when a problem downloading all2mp3 or related software being dubious. An alternative option is to check out Audacity instead, Audacity can also perform WMA to mp3 conversions on a Mac or Windows PC. Is asking for a password! this is a useless download. I’m a bit of a Mac new boy and really keen to get this working. Is this something I’ve done wrong? I tried from both the link above and also the developer site. Can you convert DRM wma’s with this? It looks like everything goes right – but when finished – there is no mp3-track! 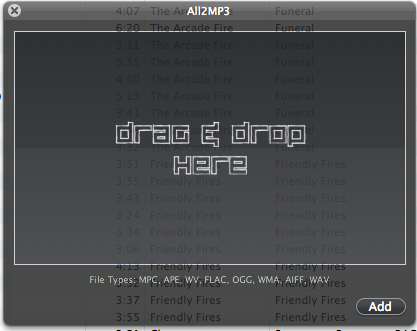 MP3 files and a “temp”WAV file for each track are placed where you ask (default = the same folder they originated). One or two files didn’t convert in the bulk upload. I just re-ran those separately. Most likely my fault since I was doing stuff on my system while they were converting. Before this, I was also trying to get this done with other big-time-crashing programs – that needed extra codecs and third party extras, no less. I have problem to drag wma files to All2mp3. The window All2mp3 doasn’t respons. This program works… easy to use… Thanks a lot! It seems to convert the audio file to a bunch of weird noises when you play it in itunes. Converted WMA files to MP3 files that were empty. Does not work in Leopard 10.6. The bugs mentioned above must be fixed now … relatively new to Macs, and just downloaded this program, ‘dragged and dropped’ 2 cd’s worth of .wma files (25 in total), and all were converted in under 15 minutes. Listening to song #8 in iTunes now, and so far each one has been converted perfectly! Thanks for the posting. Output’s to a 4KB .mp3 file. It works with 10.6.4 and it’s easy to use but .mp3 files are much larger than the .wma ones. I had few songs to be converted from wma to mp3. I downloaded the All2mp3 and now I can see all of them converted to mp3 BUT now I cant opne those songs neither in itunes or any other application. I hope I have not lost my songs that I downloaded long time ago. great program. converted not only wma and other audio formats, but windows video files to mp3. thanks a lot to topic starter. I missed an installer and any prereqs, since it seems a gui automation only. There is no info what it does. All that worked, was deleting the flac files I have sacrificed. Just did some tests. Ogg, WAV, AIF files etc. It was almost 2 years I could not use All2mp3 anymore. « iPhone is the fastest growing consumer electronic product in history. Wow.